One of the UNB teams selected for this year's New Brunswick Innovation Foundation (NBIF) Breakthru Competition already had a head start in the market thanks to a method they learned in one of their business courses. TotalPave is a business idea created by brothers Drew and Coady Cameron and Dave Kell. Lean Launch Pad was the method used to refine their vision and business plan for a technology they invented that will help engineers collect data about pavement conditions. The method was learned through a course on new venture start-ups offered at UNB through the faculties of business administration and engineering. The Lean Launch Pad was first introduced by Steve Blank, a serial entrepreneur and investor, in a class he taught at Stanford in 2010. The method was based on Blank’s 2005 book "The Four Steps to Epiphany." Blank has also shared his innovative business techniques on his online blog at Steveblank.com, thus allowing for the early dissemination of his method at universities around the world. Dr. Martin Wielemaker and Professor Mike Oliver of UNB liked the Lean Launch Pad method so much that they made it the core framework of a new venture start-up course they began offering in 2010. The traditional approach to starting a business involves a lot of time and money in researching and writing the business plan, raising venture capital, setting up shop, developing products, finding warehouses, establishing supply chains, conducting customer focus groups, etc. Enormous amounts of resources are invested even before a single sale happens. Often, after going through all this, businesses still fail because the product or service they developed simply fails to meet the needs of the customer. Lean Launch Pad offers an alternative path, allowing start-ups to be more efficient with their funds by testing customer response earlier in the customer development process. It borrows techniques from the design field, which has a strong user focus, as well as from LEAD user research, Lean manufacturing, and AGILE software development (all of which learn from users first and then incorporates their experience and recommendations into the development process). "The methodology is extremely useful for two reasons," said Dr. Wielemaker. "First, rather than spending weeks writing a full-blown business plan, we almost instantly go to users and customers to test whether our assumptions about their needs and our proposed solutions are accurate, and whether customers will be willing to pay for it. Second, it offers what Eric Ries describes as the minimal viable product (MVP), that version of a new product which allows a team to collect the maximum amount of validated learning about customers with the least amount of effort." For entrepreneurs this means that, rather than developing the perfect product before going to market, they can develop a version of the product that is sufficient enough to test and validate. With lean start-ups, primary customers who have a high need for a solution - called earlyvangelists - are asked to buy into the product. Their need is so high that often they are willing to pay for products still in the development stage. They have the advantage of using the product and the developers have the advantage testing the product. If earlyvangelists are not willing to buy into the product, then expecting the general market to do so is unrealistic. One famous example of a product developed with the Lean Launch Pad method is DropBox, a technology that allows people to use and share photos, videos and other documents using cloud storage and file synchronization. The technology to develop DropBox is complicated and expensive. To test if users would use it, the developers created a three-minute video that drew tens of thousands of people to their website. "This validated the concept for DropBox before the company wasted a pile of money in its development," said Dr. Wielemaker. For companies like TotalPave, the Lean Launch Pad method is allowing them to test their venture plan and refine it as they continue to develop the product. TotalPave is an app that uses smart phone technology to record data on pavement conditions in a very efficient manner that can help engineers determine when repairs are necessary. The students on the TotalPave team have been collecting feedback from engineers within different municipalities - earlyvangelists - who are very interested in the technology. They are using the feedback to refine the technology so that they will be able to meet their customers’ needs before they offer it in a larger market. Dave Kell, one of the team members with TotalPave, finds the Lean Launch Pad method forces them to "continuously ask questions and pivot what you think you know with what you actually know to achieve product-market fit. With TotalPave, this is giving us huge insights into how we leverage our value proposition to solve our customers pain." Over the past three years, Dr. Wielemaker has observed approximately 50 venture teams use the Lean Launch Pad method through UNB’s joint MBA-Technology Management & Entrepreneurship program and its undergraduate BBA entrepreneurship courses. "It is a useful tool for emerging business models in that it helps people validate their assumptions about the user and the product's value with less risk,” says Wielemaker. "And for this reason it could certainly help cultivate a more entrepreneurial culture in New Brunswick." 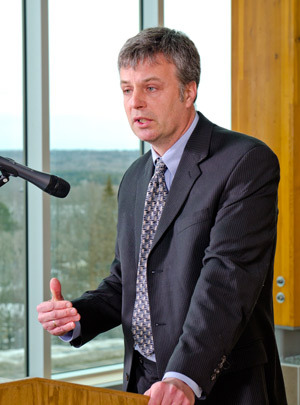 Dr. Wielemaker teaches courses on strategy and entrepreneurship with the faculty of business administration at UNB. You can read more about his scholarly activities on his UNB profile. Mike Oliver is a part-time instructor with the Technology Management and Entrepreneurship program in the faculty of engineering. He is vice-president business development & sales at Atlantic Hydrogen, a New Brunswick start-up marketing the concept of burning "greener" natural gas in internal combustion engines. Mr. Oliver has been involved in various other start-ups, including the Canada Arm used on the NASA space shuttle.